The City of Fargo - Share the Road Fargo! The City of Fargo provides more than 33-miles of on-street shared and designated bicycle lanes making biking to your destination safer and easier than ever. Before you get on the road, be sure to learn about bike lanes and road markings. Understanding and following the rules of the road will allow all drivers, on bike or in a car, share the road safely. MetroCOG's 2017 FM Metro Bikeway Map is your complete guide to bike lanes and shared use paths in the FM area. Motorists should not park in bicycle lanes. Motorists may make turns across a bicycle lane to enter a parking space or to enter a drive way, etc., as long as they signal their intention and yield to bicyclists. When parked next to a bicycle lane, motorists should always look for bicyclists before opening their car door. Bicyclists should always watch for motorists opening a door by looking ahead into a car’s rear window. Bicyclists are not mandated to use bicycle lanes. Bicyclists may exit a bicycle lane at any time as long as they look for traffic behind them before leaving the bicycle lane, yield to motorists and use appropriate hand signals. Most bicycle lane lines become dashed just before an intersection. The dashed lines notify bicyclists and motorists that this is an area where they will be mixing on a regular basis. A shared lane marking is a stencil applied to roadway lanes when there is not enough space for a bicyclist to safely share a lane with a motorist due to the width of the roadway lane. 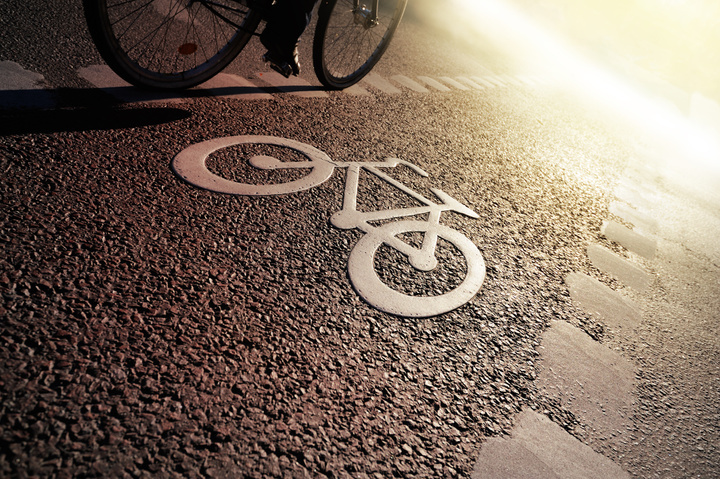 The shared lane marking shows bicyclists the most appropriate place to travel in the roadway lane so as not to encourage motorists to “squeeze by” when a travel lane is narrow. Sometimes shared lane markings will guide a bicyclist to the center of a travel lane such as on Broadway between NP Avenue and 6th Avenue North.